I bet writing about Xmas is magical, are you a big Xmas fan? Yes I absolutely LOVE Christmas, but I had to write Bella’s Christmas Bake Off during June and July so had to conjure up my own little bubble of Christmas at my desk with Michael Bublé and a cinnamon candle. Do you have any Xmas traditions? Yes, I love making (and eating!) chocolate brownies – but at Christmas I add cranberries for a little seasonal touch. Since she was little my daughter has called them ‘Rudolph the Red Nose Brownies,’ and if anyone would like to try them, I’ve included the recipe in Bella’s Christmas Bake Off. For our family it’s the beginning of Christmas. While at the BBC I enjoyed working on all kinds of programmes, but my favourite were the cookery ones where I worked with many TV chefs all of whom were lovely. I had always intended to write about a TV chef and decided to combine this with Christmas because that’s when the magic happens. I added a long lost friend, a big lie and a bake off – and I enjoyed being back in TV for a little while! What was the best Xmas gift you have received? I’m very lucky, I’ve had lots of lovely presents from lovely people over the years, but the most recent was last year when my husband and daughter gave me a framed poster of the cover of my Christmas book, ‘Snow Angels, Secrets and Christmas Cake.’ It was the first Christmas book I’d written and very special to me – it’s now on the wall near my desk and just looking at the gorgeous little cupcakes on the cover inspired me to write about more Christmas baking this year! 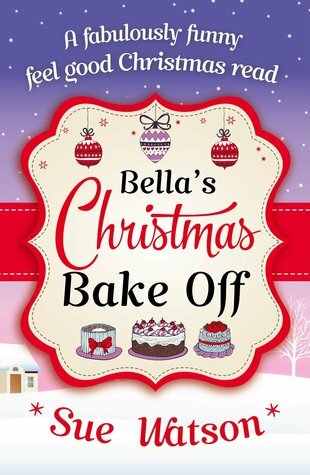 Bella, the TV chef seems to have the perfect life, a fantastic marriage, a wonderful home in the country and the most amazing Christmases where money and luxury are no object. Her old friend Amy envies Bella’s life and her Christmas - but the most magical part comes when Amy discovers all is not what it seems… and Bella discovers the true meaning of Christmas.